studios, one for 2-dimensional arts and one for ceramics. In addition, we have a kiln & sculpture yard that includes both gas and raku kilns. 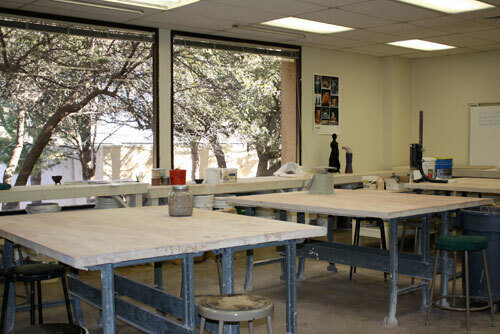 Our studios are equipped to handle printmaking, painting, drawing, life drawing, digital photography, ceramics hand-building, wheel-throwing, sculpture, and glass fusion. Our facilities are comparable to the larger universities without the enormous price tag. 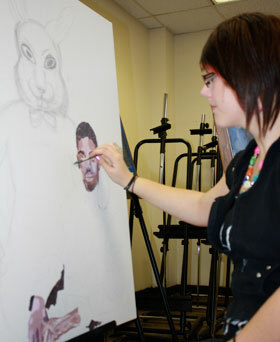 This allows you to create a strong portfolio to move on to a 4-year art program including communication design. Student work is displayed in the Fine Arts Gallery, College on the Square, the City of Snyder Animal Shelter, and the Scurry County Museum. Art Majors at WTC benefit in cost-savings, and also in many Activities which include the ability to visit Dallas/Ft.Worth, Santa Fe, Houston, or Austin as student artists, ready to tour artist studios, galleries, and museums. In addition to college courses, we provide a facility for College on the Square and Upward Bound. For more information see the Catalog for Course Descriptions, view a gallery of Student Work or complete our Questionnaire.